This meet took place at the Drumnadrochit bunk house, which is actually along the road to Cannich, and very nice it was too. Penny, Kate and Allan S had no trouble getting sole use of a room when they announced they were on the 7am boat up Loch Mullardoch for a traverse of the Munros on the north side of the reservoir. For everyone else there was a less brutal start time and an orderly queue comprising largely the EMC formed to get through the locked gate at Glen Strathfarrar. Alan R and Fiona M did Maoile Lunndaidh and An Sidhean, Gillian, Fiona C, Mike and Fiona R did An Sidhean but managed to resist the temptation to continue to Maoile Lunndaidh. Alison W and Anne C met up with Richard H and canine companions Sophie and Finbar to do the 4 Munros on the north side of the glen. Alison W distinguished herself by fishing Finbar out of a burn by the scruff of his neck whilst herself balancing precariously on a rock. A narrow escape too for Anne R who on Sunday came perilously close to paying £7 to share a tour of Urquart Castle with a large coach load of over excited foreign exchange students. Sundays weather was very pleasant, cloud free tops all around and more sunshine as the day went on. Penny bagged the Munros of Tom a’ Choinich and Toll Creagach. Fiona C, Allan S and Gillian did Tom a’ Choinich then headed west to Carn Eighe and Mam Sodhail returning via Sgurr na Lapaich. 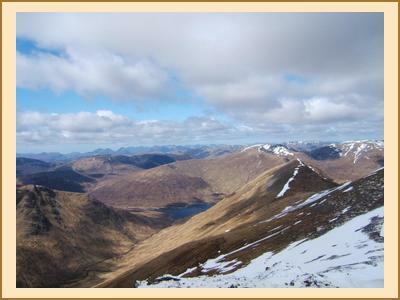 They were caught in the vicinity of Carn Eighe by Alison W and Anne C who added Toll Creagach to this itinerary. 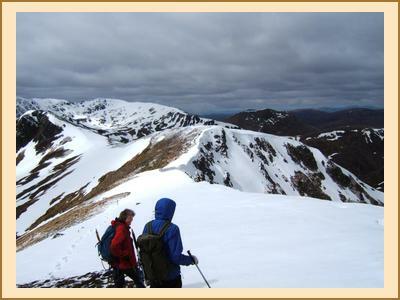 A fantastic day with stunning views and snow under foot after leaving Tom a’ Choinich – although definitely not the waist deep drifts promised by a passing back packer in the car park. I’m not sure what Alan R did but rumour has it that it involved a Corbett and Munro connected in an extremely tenuous fashion, Mike and Fiona R opted for the 4 Loch Mullardoch munros.